As a european car enthusiast and lucky to be in the car industry, one of my favorites is the Jaguar XFR-S.
Jaguars have always grabbed my attention, especially with the release of the XF. A Jaguar that actually has room in the back seats for family. The unique design screams luxury and has a very attractive price tag, making it feasible to own one. The only thing the XF was missing was the horsepower. Driving around BMW M5’s and Mercedes E63 AMG’s made me want the same out of the Jaguar. Then, my eyes were opened to the JAGUAR XFR-S. This is still the four door Jaguar XF that fits my entire family with three kids comfortable in the back. I have them glued to their seats with the incredible 550 Horsepower supercharged V8. Stepping on the gas makes me forget all about and AMG or any M series from BMW. 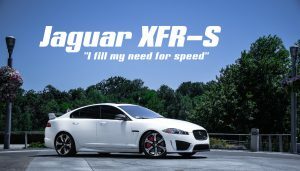 The XFR-S has a distinct style, different from any normal Jaguar with it’s aggressive look. With black leather interior and a white exterior, this is my favorite color combination. The black exterior trim especially stands out with this beautiful polaris white paint. With amenities that put any ordinary car to shame, I get the ultimate in luxury. With the horsepower, vents, wheels and spoiler I fill my need for speed.